Case: The patient is a 91 y/o female with hypertension, hypothyroidism, and Alzhiemer’s dementia brought in by ambulance from home for fever to 102 F and vomiting. There are no other complaints or symptoms per the caregiver and the patient. In the ED, the patient is alert and oriented to self only (at baseline she is oriented to location as well). Vital signs are as follows: T 102.4 F (oral), HR 120, BP 130/80, RR 20, SpO2 91% RA (95% on 4L nasal cannula). Her exam is otherwise notable for dry mucus membranes, decreased breath sounds at the left lung base, soft and non-tender abdomen, and no rash. 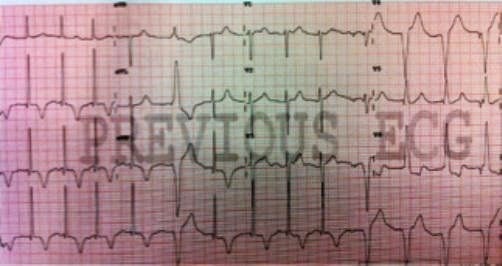 Initial studies are notable for an EKG showing sinus tachycardia without signs of ischemia and a lactate of 6.14. Chest x-ray showed an opacity in the left lower lobe, and urinalysis showed evidence of infection. Lisfranc injuries comprise only 0.2% of all fractures and can result from direct or indirect trauma. Most cases are associated with high-energy motor vehicle accidents (i.e., ATV accidents) where there is a crush injury to the foot. Indirect trauma from a twisting injury combined with axial loading of the foot can also result in plantar displacement (i.e., sports injury or falling from a step). Most Lisfranc injuries are closed without obvious deformity, making the injury difficult to diagnosis. A 35 year old male presents to the ED after a motor vehicle collision with ejection. The patient has a Glasgow Coma Scale of 4 on arrival and is immediately intubated. The patient has equal pupils and has facial and chest abrasions. The patient is initially tachycardic with a heart rate of 115. He is normotensive and saturating well on the ventilator. A bedside ultrasound shows no pneumothorax and FAST examination is negative. 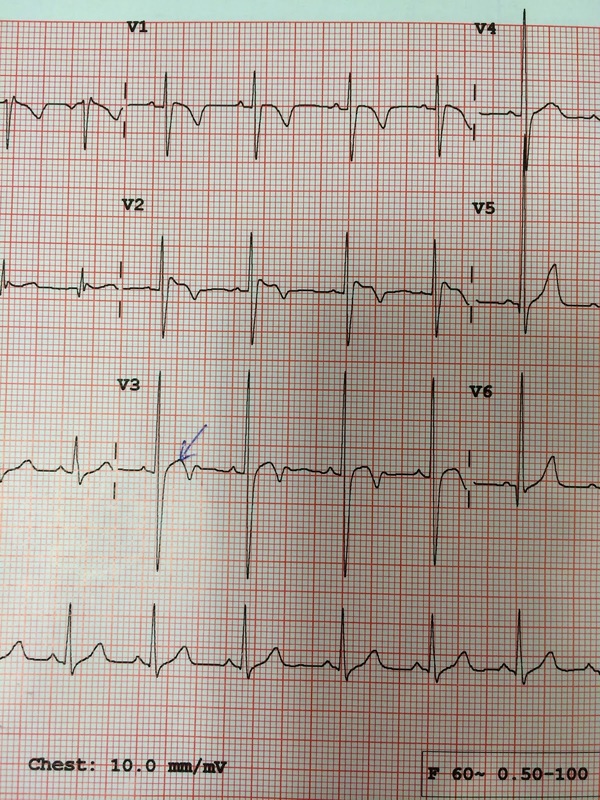 While waiting for the patient to go to CT an EKG is obtained. What does the ECG show? A 6 year old boy is sent to the ED by his outpatient cardiologist for fever. He has a history of an abnormal pattern on EKG when he has a fever. He has an implantable loop recorder. Below is a portion of his EKG obtained on arrival to the ED. His temperature was 101.2. What is the diagnosis? The patient’s EKG shows a Brugada pattern. Here (cited below) is a small study that looked at 47 patients who presented with Brugada-type EKGs and identified potential inducers. Some patients had the common SCN5A mutation, while some did not. Patients may be asymptomatic or have syncope/sudden cardiac death whether or not they have the mutation. 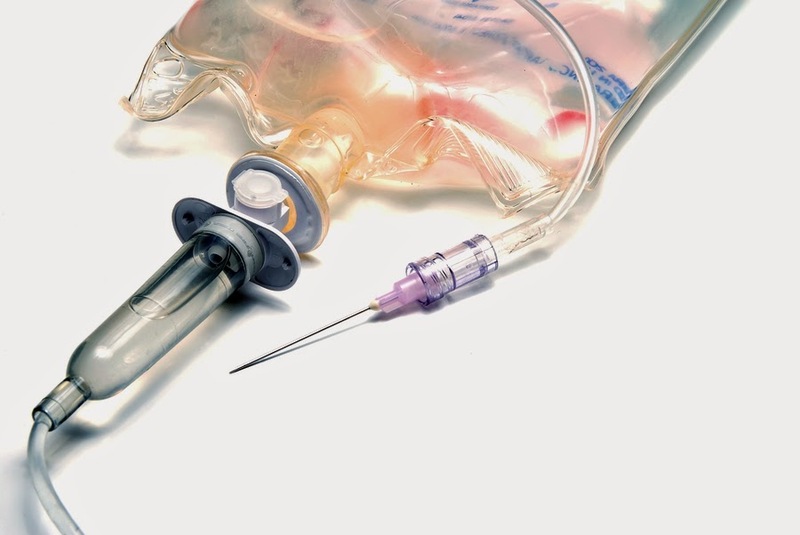 The most important aspects of treatment are stabilization of malignant arrhythmias as well as fever control and/or removal of the offending agent, if applicable. Cardiology consultation is warranted for consideration of genetic testing, electrophysiologic studies, and potential ICD placement. Junttila MJ, Gonzalez M, Lizotte E, et al. 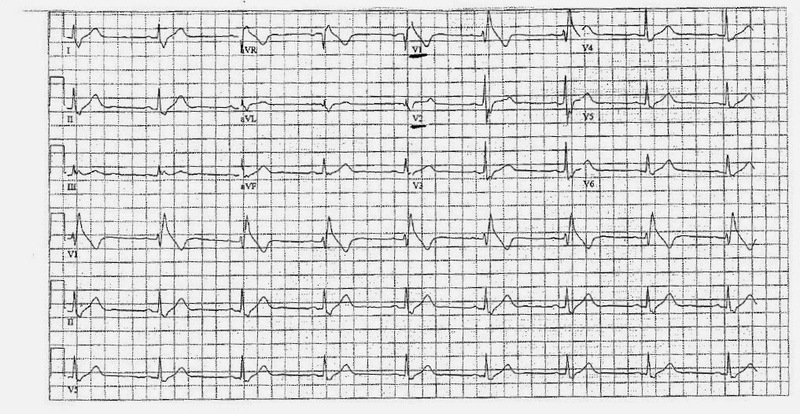 Induced Brugada-type electrocardiogram, a sign for imminent malignant arrhythmias. Circulation. 2008;117(14):1890-3. Allely, Peter. What is Brugada Syndrome?. Life in the Fastlane Blog, http://lifeinthefastlane.com. http://lifeinthefastlane.com/what-is-brugada-syndrome/. Accessed January 12, 2015. A 41-year-old otherwise healthy male presents to the emergency department after a syncopal episode while standing and waiting for the bus. He states he has been experiencing intermittent episodes of lightheadedness while at rest over the past several weeks. The patient has no other associated symptoms and no significant family history. He has no other complaints and a normal physical exam. His EKG is shown below. Brugada syndrome is a critical diagnosis for an emergency physician because left undiagnosed it may lead to cardiac arrest and death. Brugada syndrome is a disorder related to sodium channel dysfunction in the myocardium. It may be hereditary or due to a spontaneous mutation and occurs in otherwise structurally normal hearts. It most commonly occurs in males, especially those of Asian descent, and tends to present around 40 years of age. Estimated incidence is 0.05–0.60% in adults. Brugada is very rarely diagnosed in children.